There are no user reviews for GoGrid. 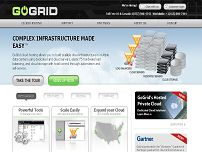 GoGrid is a division of ServePath, a company with extensive expertise and experience in web hosting infrastructure. The ServePath team wanted to develop a new kind of hosting solution to address the scaling needs of today’s businesses. Over the years, we have seen some of the limitations with dedicated servers and managed hosting. Virtual servers have been around for awhile and always seemed like a good idea, but somehow they always seemed to be not good enough. Through our experience in the dedicated server hosting market, extensive R&D in Xen-based grid technology, and needs of the many rapidly growing companies we serve, the answer became clear. GoGrid is a leading Cloud Hosting provider with extensive expertise and experience running complex, on-demand cloud, dedicated and mixed server infrastructures. With over 10 years of dedicated hosting experience, our team wanted to develop a new kind of hosting solution to address the scaling needs of today's businesses. Over the years, we have seen some of the limitations with dedicated servers and managed hosting, in terms of flexibility, elasticity and their lack of an on-demand nature. Virtual Private Servers have been around for awhile and always seemed like a good idea, but somehow they always seemed to lack the performance, throughput and reliability of physical boxes. Through our experience in the dedicated server hosting market, extensive R&D in Xen-based grid technology, and needs of the many rapidly growing companies we serve, the opportunity became clear. Our answer to that challenge is GoGrid, the first multi-tier, cloud computing platform that allows you to intuitively manage your cloud hosting infrastructure completely on demand through an intuitive, web interface, or programmatically through a REST-like Application Programming Interface (API). We are based in San Francisco where we operate our own data center and manage thousands of servers for customers all over the world. We have been in business for nine years, but before that our founders ran a successful Internet access ISP that started back in 1995. We are a group of experienced and geeky professionals with hundreds upon thousands of combined hours of technology expertise, and we also know how to provide powerful Internet hosting services to businesses that need reliability, customization and speed. GoGrid is the next generation of cloud hosting and Infrastructure as a Service. Get powerful dedicated resources on a cloud computing architecture that you can use as you need, on-demand. Once you try GoGrid cloud hosting, you will see how the power of cloud computing will transform how you think about and architect your company's infrastructure. "Complete Cloud Computing Infrastructure Hosting, Load Balanced server networks & Cloud Storage. This acct is managed by @hightechdad"